Typing properly comes with practice though if you are really serious, buy a very cheap keyboard (more like the originals anyway) and stick labels on the top of the keys. 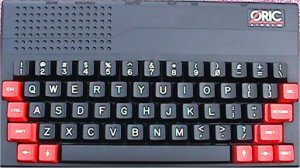 If you want to get the feel of working on a ZX-80 then get one of those rubber roll-up keyboards, bury it for a few months, run over it a few times and it will still be far too good compared with the original! During my research, I have come across a number of excellent emulators. These run on Windows computers (some run on Macs) and permit you to try out some of the computers above at zero cost (or for a very small sum). Some machines have more than one. It is also not a comprehensive list but simply tries to provide an option for every computer in my collection. The emulators are either easy or difficult to use dependant mainly on keyboard mapping. The PC keyboard layout is not the same as the old computers so having to remember to press a # to get a + or whatever can be confusing and irritating. I have often dreamt of having keys with LCD tops onto which the actual key description could be displayed. Some emulators have properly mapped keys so you press what is in front of you on the keyboard. As I said, this is not a comprehensive list but if anyone wishes to add any more to it then please contact me. Unless stated, I believe the product to be Freeware but always check. Note also that some are provided without a copy of the necessary ROM in case they are still in copyright. If you own the original computer then you can easily locate and download a copy of the ROM (easier than grabbing your own). Note that all testing has been done on a Dell Latitude X1 laptop running Windows XP Pro and a UK keyboard. Where the program has to run in Windows95 compatibility mode then I have made comment. I have used the same groups for the emulators as for the collection itself. ©Copyright Greg Taylor 2011. Not to be copied to any other document or web page without permission.